When I ask an athlete how their race went, I often hear that they had a great swim and bike, then the struggles began during the run and eventually the wheels fell off. And these are athletes who typically run well in stand-alone running races. So what does it take to make the run your weapon in 70.3 or IRONMAN racing? Running well off the bike is a combination of five main factors. Training specificity, or simulating what happens during a race, in your brick sessions is one aspect. Making sure that not too much energy is expended on the bike through proper pacing is another. Fueling your body with proper nutrition is a third. A fourth consideration is bike fit, along with general muscle balance and overall flexibility. A final aspect, often overlooked, is the importance of mentally being prepared to deal with that change from cycling to running. Here is a list of how you can address each area to build your ability to run well off the bike. Training specificity involves running off the bike at a pace you aim to maintain during your 70.3 or IRONMAN distance event. There are several reasons for this. One is getting accustomed to the different motion of the legs and the fact that the legs are now supporting the weight of the body. Another is training the body for the endurance and speed for the duration of the run. The best way to accomplish this is to consistently incorporate runs after both long and short rides, known as “bricks”. These brick runs will vary in duration and intensity through the different phases leading up to a race. In the General Preparation Phase the goal is to condition the body with short 15 to 20 minute base runs following at least one bike ride per week. During shorter weekday rides, the runs can be at a higher heart rate. As you transition toward the Specific Phase the runs increase in duration. The closer to the event, the more the runs should mimic the demands of the race. At this point they should also be at or slightly above race intensity. One example is 45 minutes as 30 minutes at goal race pace and 15 minutes easy. Another is 4 x 1 mile at 10 to 15 seconds faster than goal race with 2 minutes easy jog in between efforts. It is also crucial during the final six to eight weeks to dial in race nutrition, both on the bike and the run. The gut needs to be trained to absorb enough calories to maintain race pace. In the same vein, your pace on the bike is a huge factor that affects the run. Ride too hard and there is nothing left in the legs to push for the final 13 or 26 miles on foot. This is where having a power meter and performing consistent testing throughout training is invaluable. There is a fine line between having a superb bike and a miserable run. For strong age group competitors, maintaining an effort of 75 to 88 percent of Functional Threshold Power (FTP) for a 70.3 distance event and between 70 and 80 percent of FTP for an IRONMAN is a general rule of thumb. If you expect to be on the course longer, then these numbers need to be dialed back. No matter how fit you are, if your nutrition strategy is not adequate you will eventually face the consequences. Use every opportunity, especially your race specific training, to experiment and figure out just what does and does not work for you. Another factor of going too hard on the bike is that your leg muscles are drawing the oxygen rich blood from your heart. This means that your stomach does not empty of nutrients and fluids quickly enough, leaving you with that sloshy feeling starting the run. This then requires you to slow down to regain composure and energy. Bike fit and body conditioning will also impact running off the bike. The ultimate purpose of riding a time trial bike is to be as aerodynamic as possible. But this should not be at the expense of comfort or the ability to produce power. If you look at pure time trial racers the position is extremely aggressive as the riders do not need to run afterwards. 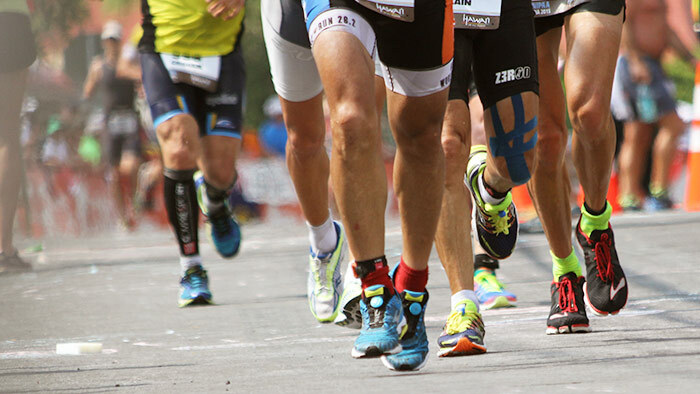 As a triathlete, you are looking for a position that is balanced and allows a fairly wide range of motion at the hips. If your hip angle is too tight the hip flexors may tighten up and this will negatively affect your stride. This is why some triathletes opt for higher aerobars, or shorter cranks in order to open up the hips. To run well, your running motion needs to be fluid and relaxed. The same thing needs to be considered with conditioning and flexibility. Many athletes tend to have occupations that require hours of sitting at a desk in a hunched over position. Regular standing and stretching as well as a routine such as yoga can alleviate this shortening of the hip flexors, lower back and hamstrings. This is perhaps one of the biggest limiters we see with the amateur athlete; finding time to develop a core strength and stretching routine. Most older athletes that are performing well are proactive about core strength and flexibility. A final note to consider is the mental component of a successful run off the bike. Towards the end of the bike, many athletes are ready to get off the saddle and start running. However the changeover is often mentally tough. As the speed is significantly slower resulting is less air cooling, body temperatures often rise, and the perception of speed can feel very slow. Know this in advance and prepare for it. Use the first few miles to dial in a rhythm by focusing on cadence and proper form. Once the body settles in the mind can then pick off one segment at a time. It is important to stay in the movement and not get too far ahead of oneself during the run. Begin to incorporate some or all of the above elements in your training and the races will become that much more satisfying. And complete.